Kaitlynn’s “Just Right” Bag measures 4” x 7” and is large enough to hold your i-phone, extra change, keys, ID, glasses, etc. It has 2 interior slots, a ID window, and it’s “just right”! 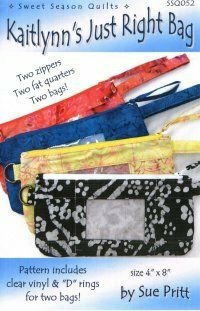 Pattern includes 2 “D” rings and clear vinyl for making two bags.